I learned that leftover / refrigerated avocado is messier than fresh cut. Spencer likes to share Sasha's apples. 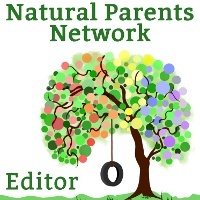 for the Natural Parents Network Wordless Wednesday. Sasha went to her first (trial) Camp Fire meeting. (correctly, I might add) in front of the entire Camp Fire group (of mixed ages). This is what Spencer has been up to! Photo taken at our chiropractor's office. Aside from my own kids, of course, I think you have the cutest kids ever! Aww, thank you! Your babies are adorable, too!